According to the Chinese calendar, we’ve officially moved out of the year of the Fire Rooster and into the year of the Dog. I for one could not be more excited to leave any fiery animal behind in favor of something more grounding. 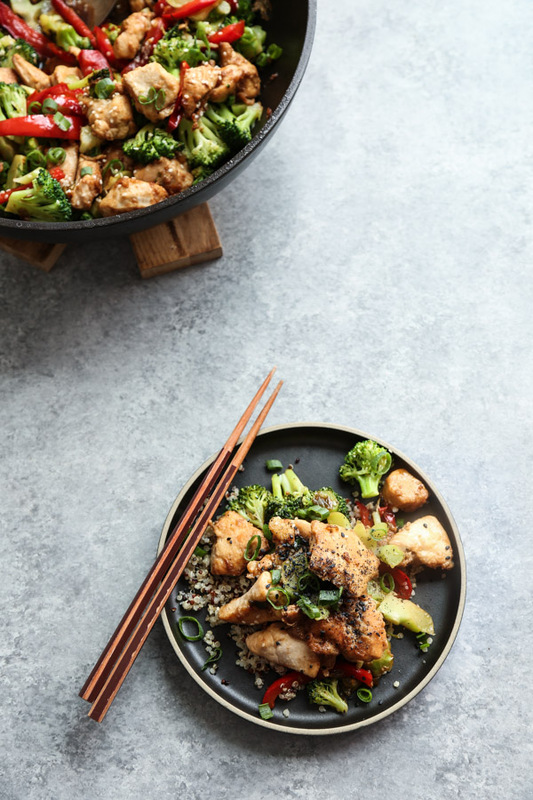 To celebrate, I thought I’d revamp a classic dish from my old Grand Szechuan days of freely eating gluten-laden Chinese food: sesame chicken and broccoli. Sesame chicken is one of the more egregiously unhealthy options on the Chinese menu. And it’s more addictive than crack. The combination of deep fried chicken coated with a sauce that is 75 percent sugar, basically gives your saliva glands a pleasure-induced panic attack. A.k.a. the chicken melts in your mouth. I try not to mess with my hedonist dreams, but at the same time do things a little healthier around here. 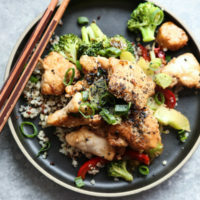 After a little investigating, I found these two healthy sesame chicken recipe variations via Iowa Girl Eats and Simply Scratch. I loved that the chicken was coated in cornstarch instead of flour and pan-fried. 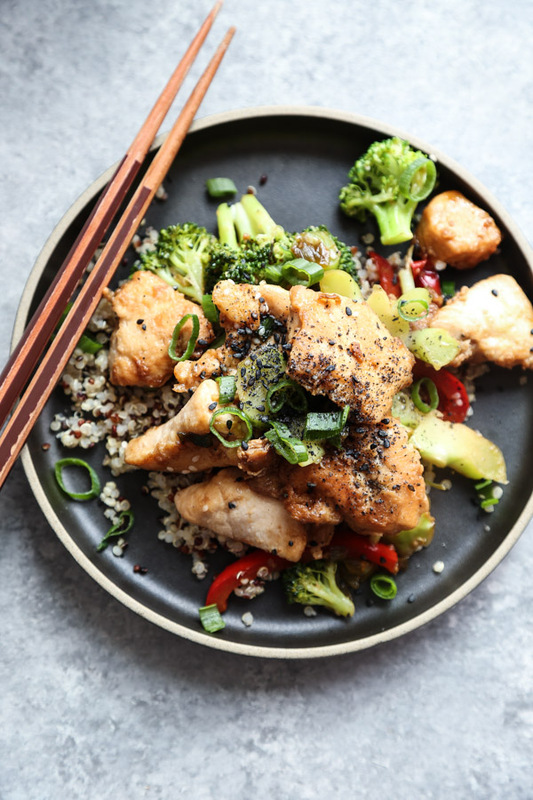 I cut down on the honey even more and the dish that resulted was a hybrid of chicken and broccoli and sesame chicken. If you’re going the Paleo route, you can easily sub tapioca starch for the corn and coconut aminos for the tamari. for a low FODMAP version, simply swap honey for maple syrup and green beans for the broccoli. One health hack that I always do is make sure the ratio of vegetables to protein is always 1:1. When I used to order chicken and broccoli from my local greasy spoon Chinese spot, I’d always end up with half a leftover container full of just chicken. I hate it when vegetables are just an accent. Plus, there’s something about the way broccoli florets absorb sauce that’s just as intoxicating as munching on a piece of fried chicken. So why not embrace it? I was lucky enough to partner with the talented and lovely Kristin Kremers to create a how-to video of this Feed Me Phoebe favorite! Make sure to watch below. And speaking of favorites…are there any other takeout delicacies you’d like to see a healthy and/or gluten-free version of on this site? Let me know in the comments! p.s. If you’re looking to save time in your low FODMAP kitchen, check out some of these fabulous store bought sauces, spice mixes and condiments. 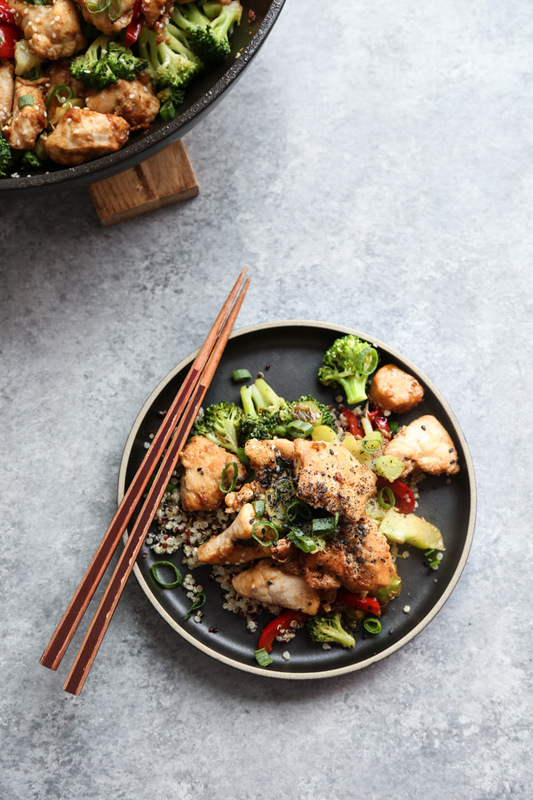 This healthy sesame chicken recipe with broccoli is a lighter version of the Chinese take-out classic with gluten-free tamari, honey, and a gentle pan-fry. See how to make it with my simple video step by step! 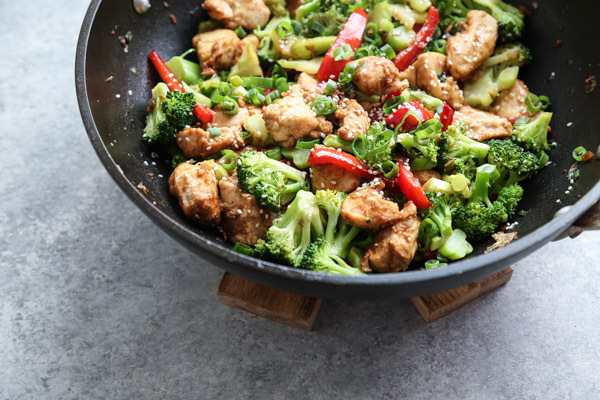 In a large wok or lidded skillet, cover the broccoli with 2 cups water. Bring to a simmer over high heat, reduce to medium, then cover and cook until vibrant and tender, 1-2 minutes. Drain in a colander. Rinse and dry the skillet. Meanwhile, whisk together the egg white, cornstarch, and salt in a large mixing bowl until smooth. Add the chicken and toss to combine. Heat 1 tablespoon of the coconut oil in the cleaned skillet over high heat. When hot, add the chicken in an even layer. Cook until golden brown on the first side, about 2 minutes, then stir fry until the chicken is cooked through, about 4 minutes more. Transfer to a bowl and set aside. Add the remaining vegetable or coconut oil and stir fry the peppers and white scallions until lightly charred, 2 minutes. Stir in the garlic and cook until fragrant, 1 minute. Add the chicken back to the pan, along with the tamari, sesame oil, honey, and sesame seeds. Simmer until the sauce has thickened, 2 minutes. Stir in the broccoli and green scallions. Serve over brown rice or quinoa. If you find that the chicken sticks to the skillet, you can added an additional 1/2 cup of water or chicken stock with the sauce to help deglaze the pan. Usually, the peppers are enough to release those brown bits. I will be making this! Yikes! I had no idea there was so much sugar in the original version. 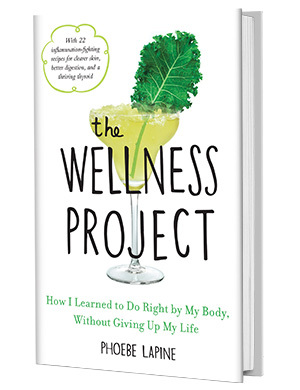 You are consistently coming up with amazing recipes ~ I’m trying to think if there is anything that I’d love to see a healthier or gluten free version of. Maybe chicken piccata or chicken marsala? I love italian food but I always feel like the dishes have A TON of butter in them when you go to restaurants and I haven’t tried to make them at home because I’m not sure how to make them taste good! I second Leah’s coment. Let’s have veal piccata but with olive oil or something, and coated with white rice flour? Or potato gratin done healthier? I remember you did a fantastic version of tuna-noodle casserole. 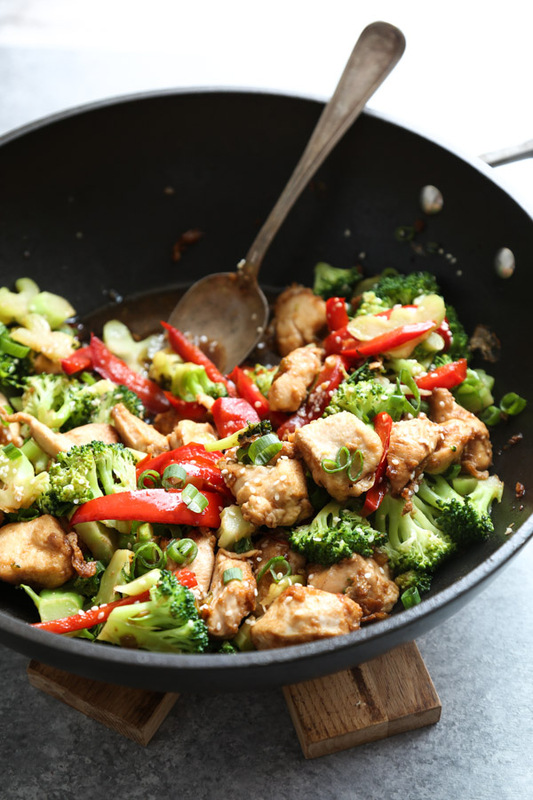 Silly question… Did you boil the red pepper with the broccoli or cook it in the pan with the onions? Am I just missing where it’s mentioned in the directions? no silly at all! i’m the dummy who wrote onion instead of pepper in the directions. you saute with the scallions 🙂 enjoy! We made this for dinner last night and it was excellent! My husband, who is usually skeptical of ‘healthified’ meals couldn’t get enough. I think next time you could even cut back on a bit of the honey, it seemed plenty sweet. Thanks for the yummy dinner! Hi! I made this for dinner last night..and it was great! I also added sliced mushrooms. My husband said it was a “keeper” 🙂 Thanks for the great recipe! Oh wow! I’m making this tonight! found your recipie on Pinterest….OMG it was so easy (I’m a terrible cook and married to a chef)!! He LOVED IT! We both did. it wasn’t too heavy, and was perfect portion for no leftovers! thank you for sharing! Excellent, my entire family loves this recipe. My son (7) ask me to make it again yesterday. I don’t add the honey at all and it taste great. Thank you for healthy option recipes that are easy and yummy. This was delicious and pretty easy to make! I used chicken thighs instead of breast and regular yellow onions because I didn’t have any scallions. Tasty none the less! I served it with black rice. Definitely making this again. ooo love the idea of black rice!! So glad you enjoyed! Just made this and it is very good! Used whole wheat flour instead of cornstarch and soy sauce instead of tamari and 2 tbs of honey! Turned out great! Thanks for the recipe! awesome! 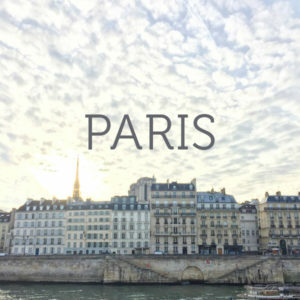 thanks for sharing your tweaks! So thrilled you liked it! Loved this recipe! MY wife will love it too. 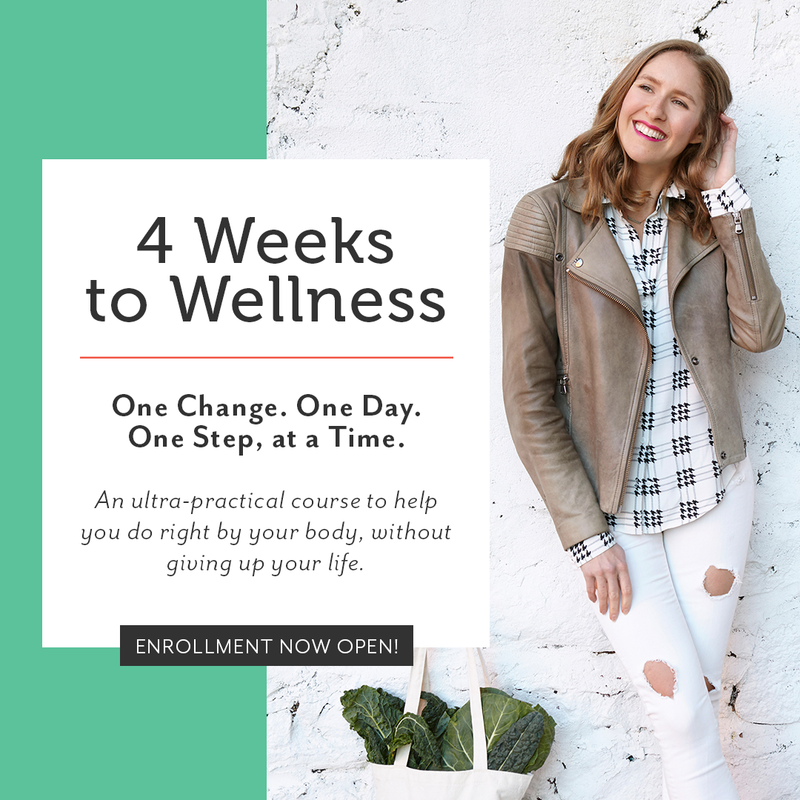 I cannot wait to peruse your site for more great recipes! I’m sorry for the belated response! I hope it worked out. I assume it did. I would just brown the steak and then stir it back in at the last minute as to not overcook. Let me know how it went! Made for my family and they LOVED it! Fabulous!! Thanks for reporting back! Was there a calorie count for this? I don’t do calorie counts, sorry! This looks great! I am thinking about making it tonight. I am not GF so I was considering switching out the honey with Hoisin Sauce and I’ll definitely be using Soy Sauce instead of Tamari. Thoughts? Thanks for the recipe! awesome! sure you can add hoisin sauce. not sure how that will affect the overall flavor profile, but there’s definitely plenty of sugar in there to compensate for the honey. let me know how it turns out!! gluten-free soy sauce alternative. you can easily use soy sauce! Can you use arrowroot instead of cornstarch? How much would you use? Same as cornstarch? Thanks! !! Excited to try this. Hmm. I’ve actually never worked with arrowroot starch before! I know that makes me a naughty gluten-free girl. 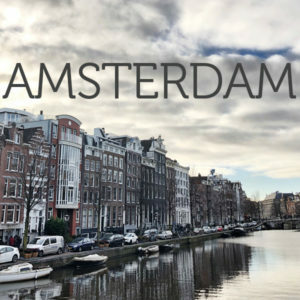 But I don’t see why not – worth a try? Let me know how it goes! If you had told me this was made in a restaurant ….I would have believed you. If you told me I had made it …….I would not have believed you. Delicious. I am not the fastest cook so it took me a little longer , but not much. I definitely will make this again. I’m so glad you found it quick and satisfying Rick!! I love reports like this. Thank you for taking the time to comment. I hope you’ll try more of my recipes! It looks delicious; I can’t wait to try it! However, I’m a bit confused over the directions. Step 3 says “Heat the oil”, I assume you are referring to the vegetable or coconut oil? Then step 4, states, “Add the remaining oil”, so should I only use half a tablespoon at first, and then add a second half tablespoon for step 4? Also, can you recommend how many cups of rice to make? 1 cup of dried rice renders about 4 servings. I’m in Western Australia. I made this last night for dinner. We all loved it, even my son who hates broccoli, ate it ….. so happy. Definitely keeping this recipe on file. how wonderful!! so glad it found its way into your kitchen across the world! As I hit the subscribe button think there was an Australian behind my email address. It doesn’t have an Australian at the end. Couldn’t figure out a way to go back and check. I like to try healthier recipes, have several in family who are gluten free for valid medical reasons. Looking forward to having recipes like these for easier mealtimes. I’m also sugar free so makes cooking for all a challenge at times. The sees me chicken is first on the try list. Thanks Janice! I made sure you’re subscribed. I hope that the recipes are helpful for feeding your family. I am also on the low sugar train, so you’ll find that my more recent recipes are mostly sugar-free. Enjoy! Just tried this and it was delicious. I also added shrimp to the recipe (although it would have been just as delicious with just chicken). Next time I will double the recipe as my family gobbled it up and wanted more. My husband is always asking for stir fry dishes and I’m not a fan so I’m always hesitant to make them. But this was a winner! I loved it, husband loved it, even the kids loved it, broccoli and all! yay! so glad hub and kiddos were happy campers! Just made this, it was absolutely amazing! Doing Whole 30 so I used potato starch instead of corn starch, no honey and added mushrooms and cauliflower fried rice. My husband who is really not doing Whole 30 said it was “primo”! Thank you for sharing! MAde this last night and it was soooo good!! I added some sliced mushrooms and a few cashews and it was soo delicious! Definitely adding to the rotation! Yum!! yay! I’m so glad you liked it Sadie!! Phoebe, how about a takeout Kung Pao chicken, or shrimp version? Love your book, love your blog, thank you! Hi Phoebe, Did you serve yours on quinoa? I was thinking of making quinoa with chickpeas to serve the chicken on. a fabulous option! I use brown rice or quinoa most of the time. Thank you so much! This was liked by the whole family. I would love to know how much carbs are in this and protein in each serving?? The recipe looks great but I have a family with an egg allergy. Is there a substitute for the egg or can I omit that step? you can try to omit and just coat in the cornstarch. Or you can use a “flax egg” – mix flax meal with a few tablespoons water. also healthy!